Textile Exchange (TE) launches their sixth Farm & Fiber report giving an update on the organic production worldwide. Those producers with strong organic programs, particularly those with a committed customer base, are not only solid but increasing capacity each year. 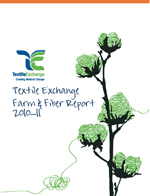 Textile Exchange (TE) launches their sixth Farm & Fiber report this week. This report gives an update on the organic production worldwide, and for the first time showcases several other cotton initiatives that working on the wider sustainability agenda. Momentum to seriously address sustainability issues within the textile industry is gaining traction at the brand level. While initial surveys from the 2011 Cotton Market Report indicate the clear majority of responding brands and retailers are maintaining or increasing their organic cotton commitments, this message is not making it to the farmers. Guaranteed subsidies or benefits from other sustainable cotton initiatives, especially coming out of a recession, are luring farmers away from planting organic on vague market signals or speculation. That coupled with several factors in India, the largest producer of organic cotton for four years running, is having the biggest effect on global organic fiber production. Next year (2011/12) TE is expecting a further five percent decline, which is nowhere near as dramatic as the drop experienced this year. All the same, the future of organic cotton depends upon the sector undertaking some major changes immediately. “We are seeing most of the production decline occurring in India – where almost 70 percent of our organic cotton is grown. This fall of around 47 percent will obviously have a serious impact on the amount of organic cotton available to brands and retailers with organic cotton collections and without formal partnerships. Which is the reason for a specific call to action. Particularly consistent in terms of production increases are Tanzania, Mali, Egypt, Benin, Brazil, and Central Asia. In fact, Central Asia (Kyrgyzstan and Tajikistan) is proving to be a great success story; with Kyrgyzstan moving into the top 10 producers for the first time, and Tajikistan with its new cooperative status. “Next year we are expecting another fall – but hopefully within 5 percent of this year’s figure. We think India will drop another 10-15 percent and USA is down around 83 percent due to devastating droughts they experienced last year. In other countries where production is expanding, which equates to almost two thirds of organic cotton producer countries, it is due to the integrity and robustness of this committed business model. Turkey and Tanzania’s production is looking good, with production up 36 and 24 percent respectively,” adds Liesl Truscott, Textile Exchange’s Farm Engagement Director. Textile Exchange Farm & Fiber Report is available free to members or can be purchased here for $400 or by emailing Donna Worley at Donna(at)TextileExchange(dot)org. The jam packed Executive Summary can be purchased for $50 here or by emailing Donna Worley at the address above. To accompany the report, TE is releasing their second Cotton Briefings series, titled Organic in Action. Briefings will be freely available online here. Founded in 2002, Textile Exchange (formerly Organic Exchange) facilitates expansion of the global organic cotton and sustainable fiber supply and marketplace by working closely with the entire value chain, from farmers and textile suppliers to retailers and consumers. Textile Exchange has hosted numerous conferences and trainings in supply chain centers around the world, including Brazil, China, Germany, India, Peru, Portugal, South Africa, Sweden, Thailand, The Netherlands, Turkey, Uganda, the United Kingdom, and the United States. Visit the Textile Exchange website (TextileExchange.org) for more information.